If you haven’t tried growing garlic in the mountains or you’d like expert tips from an experienced grower, join our two sessions on Sunday April 24th and Sunday May 8th and learn to Grow Great Garlic, with Jan Lambert. Places Limited: Booking Essential: Register For Your Place Now! The Winter Magic Festival is on Saturday 20th June. Once a year, on Winter Magic Day, Katoomba Street is uncharacteristically bursting at the seams with tens of thousands of people. It’s a great day to get out, to brashly banish the winter blues, to come together with visitors from near and far and marvel at the parade, costumes and stalls galore. And at some point during any Winter Magic we all need an oasis of calm, somewhere to relax and recharge before rejoining the throng. Around the Co-op we’re creating that little place of peace, where you and yours can come and chill out in Ha’penny Lane. 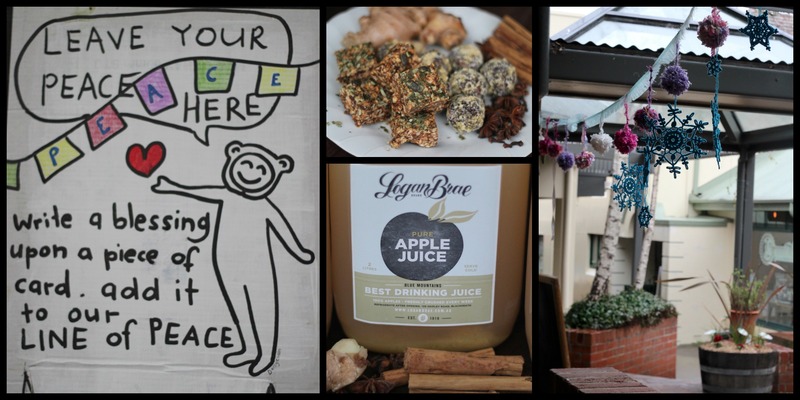 We’ll be selling hot spiced Logan Brae juice outside the shop along with sweet treats to eat – locally made bliss balls and other winter apple treats from Addiction Foods. All proceeds of these treats will go to help Winter Magic Sustainability and Earth Recovery . Moroccan chickpea stew with pumpkin and apricots served on turmeric rice with a green olive and preserved lemon yogurt dollop. We’ve invited our treasured regular buskers and a few very special guests to our peaceful chillout space. Zeb Olsen & Nick Strike- with their improvised guitar soundscapes and others. Check us out on Facebook for details! Come along and share your messages of peace on our recycled card and hang them up in the laneway in an installation of our communities words of peace. Many thanks Amy Bell-Daisychain for the art work and our community of yarn bombers for your contributions to this event! 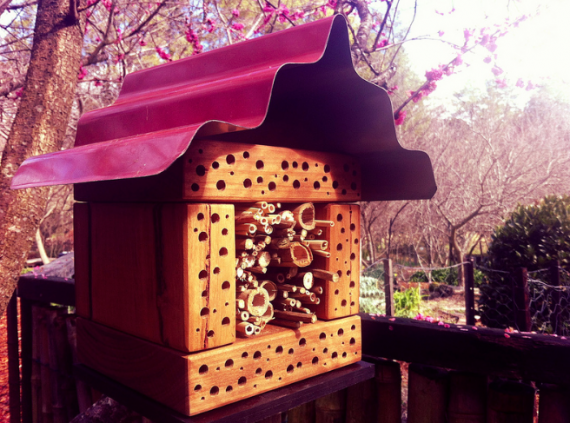 Have you ever seen a reed bee, resin bee, leafcutter bee, masked bee or blue banded bee? They’re just some of native bees out there in all our gardens. Most native bees are quite a bit smaller than the honey bee we’re more familiar with. There are over 1500 species of Australian native bees, 200 of those in the mountains. Most are semi social or solitary, and what’s perhaps more surprising is that there’s really not a whole lot of research out there about them, including big gaps in our knowledge about their distribution. This week she’ll be talking about and making wholefood smoothies – the simple way to increase your nutrients through smoothies for the whole family! Emily is a Naturopath, Healer and Mama who was born and bred in the Blue Mountains. She is passionate about digestive, reproductive, child and family health and has been deeply inspired by Kay Ridgeway. She practiced in Sydney for 7 years and now works from her home in Leura.